"Of course we can get snacks, I was waiting on you to get here before we did." You turn to Featherweight. "We can talk again later, Feather, gotta get the good seats you know?" Featherweight nods. "Y-yeah, I'll see you later!" You and Rumble walk up to the doors of the building and you call over your shoulder to Feather. "Good luck on the pictures, I wanna see some of them next time." You smirk and give him a little wink that makes him smile awkwardly and tuck the camera to his chest again. He knows you saw him take that picture earlier, and that you didn't call him out on it. Rumble looks up at you as you both enter. "So, why Featherweight?" "I don't know what you mean, he was there and I just struck up conversation." "Button told me about the bet." You pause. "...oh" No sense in lying to your close friend, but in public is not the best place to talk about it so you change the topic. "We can talk about that later. So what'd you do at the camp that made you change your mind?" Rumble sighs. "Thunderlane and the cutie mark crusaders helped me feel better about going and all, it's no big deal. 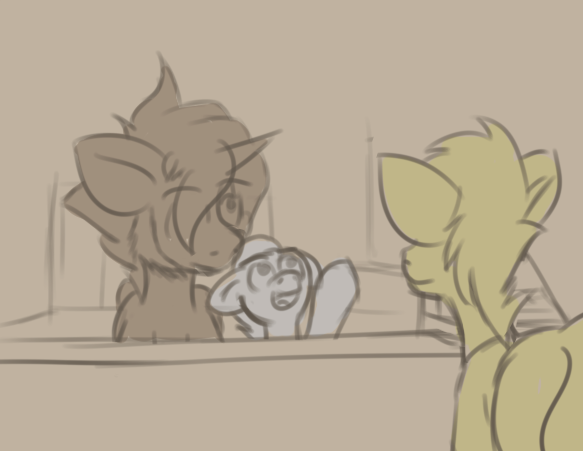 I got to make some stew with, and they made a Wonderbolts obstacle course, and we did some canoeing, and a bunch of other stuff." His expression brightens as he talks. "I just didn't know it could be as fun as it was." You two get to the snack bar. Rumble orders a soda, some chocolates with crunchy pieces in them, and a big bag of popcorn. Do you want to get something? What do yo do?